OK, I admit...not the loveliest photo but I really wanted to share this idea. 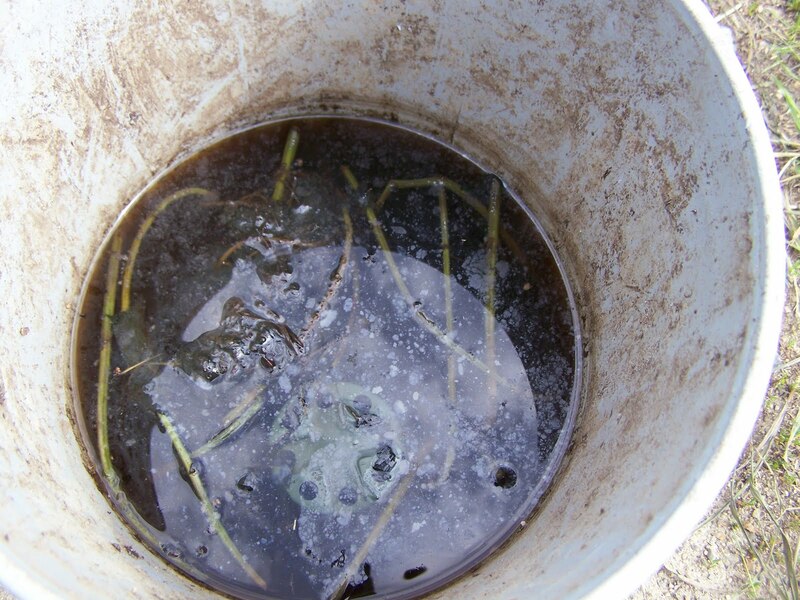 Since I am short on compost right now I wanted to find a substitute for compost tea. I don't have any comfrey planted here so I couldn't use that but happily I recently learned that Stinging Nettle also makes a wonderful fertlizing tea. It is full of nitrogen, potassium and other minerals. Here is a link I just found with some interesting details. 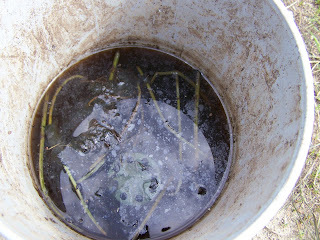 I put a large bunch of nettle into a bucket and then filled it with water. I left it to sit for several days and then started using it (diluted!) on my plants. Simple, cheap and effective. I love making use of what I have on hand to improve my garden. I love nettle fertilizer! So nasty, yet so effective :). I think it's kind of refreshing to see a photo like this on a blog...isn't this REAL? Sometimes I find myself contriving photos to represent my life as almost-perfect...but maybe it's time for a picture of the straw I clean out of the duck barn, for mulch...lots of poop and perfect for keeping the weeds down! Heehee! can never have enough nettles, just so damn great for everything aren't they. How is it that you do not have comfrey planted in your garden, so easy to propagate, great mulch plant and so on, I know you had a floor full of drying plants, how come you haven't picked up a bitty root to plant? Homesteadgirl - too funny! Yes, I think a photo op for the poopy straw would be great. ;-) Also would like to see more photos of gardeners in their Grubs! You know? With dirty knees on their pants, grubby, holey old shoes, and dirt under their nails. I like authenticity. Hi MomenttoMoment - I know, it IS crazy that I don't have comfrey here. I pick it at a friend's house but really would like to have my own because I'd like to try using the root for some things too. Right now we are renting this property while we look for our own acreage to buy and I just didn't feel comfortable about planting something so invasive on someone else's property, I think when we are gone it would likely take over because other people might not manage it. I had it in my old garden and when we get our acreage we will be planting it again for sure. It just has so many great uses. I'd assume broth would be good too for a compost.